... you must first invent the universe. This may be the best opening to a documentary ever. 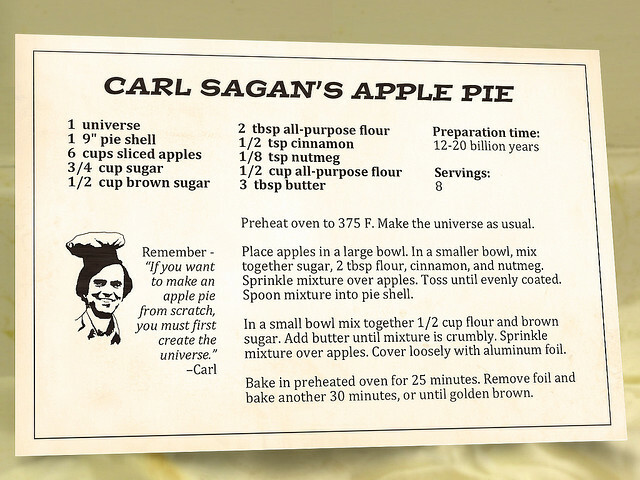 Here is a recipe for Carl Sagan's famous apple pie (by Neven Mrgan). Carl Sagan was more than just an astrophysicist. He was a poet. He had a way of making what is distant tangible; of conveying the joy of discovery and the sense of mystery and wonderment that make "doing" science so satisfying. It is estimated that his 1980 series "Cosmos" has been seen by over one billion people. Below is one of my favourite clips from the series: "Pale Blue Dot". Update: For the voyeurs out there, here is a picture of Carl Sagan's house in Ithaca, NY (via Caitlin Wellman).